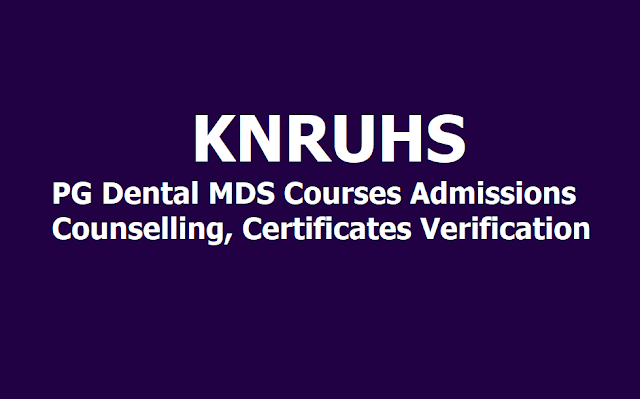 KNRUHS PG Dental MDS Courses Admissions Counselling, Certificates Verification Dates, List of Documents 2019: Kaloji Narayana Rao University of Health Sciences, Telangana, Warangal has issued the notification for on-line applications from candidates who have become eligible after lowering of cut-off score for admission into MDS Courses for competent authority quota in dental colleges for the academic year 2019-20 in the state of Telangana. 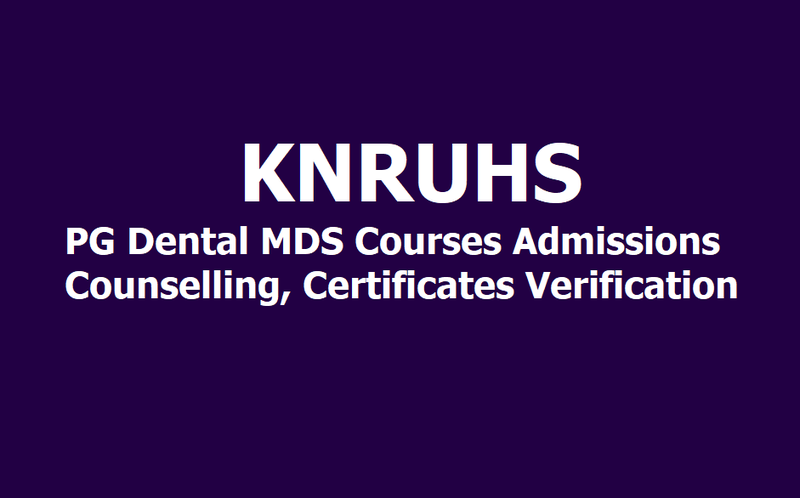 Application forms through online are invited from candidates for admission into competent authority seats of MDS courses for the academic year 2019-20 into Dental Colleges affiliated to KNR University of Health Sciences, Warangal in the state of Telangana from the eligible candidates who have fulfilled the following conditions and secured the following lowered cut-off scores and above in NEET MDS 2019. Notification issued is for permitting candidates who have become eligible after lowering of cut-off score and for inclusion in Merit list for admission into Competent authority Quota Seats only. Total number of vacant seats available under Competent authority Quota for the academic year 2019-20 will be notified on KNRUHS website before counseling. Fee structure will be as fixed by the Government as per G.O.Ms.No.41 HM&FW(C1) Dept. Dt .9-5-2017 & as per Hon'ble High Court interim orders. Revised cut-off scores for MDS courses in NEET MDS 2019 Exam. Candidates can apply on-line on web-site https://tsmds.tsche.in from 10.00 A.M. on 06-04-2019 to 4.00 P.M. on 09-04-2019. The on-line application can be filled through any computer with internet connection with internet explorer 11 version. ** Under any circumstances fee once paid will not be refunded or adjusted to a further date. Merit position of the applied candidates will be prepared based on NEET MDS 2019 Score and included in the merit list. For eligibility and other details refer to detailed notification & Prospectus for Competent authority quota admissions issued earlier on 26 -03-2019 carefully. The prospectus of the course, instructions of filling on-line application form is available on University web-site www.knruhs.in. 1. Candidates who have completed the on-line application process already with reference to earlier notification for MDS Courses need not apply again. 2. All further notifications will be displayed on KNRUHS website. Candidates are informed to check the website regularly for updates. No individual communication will be sent.